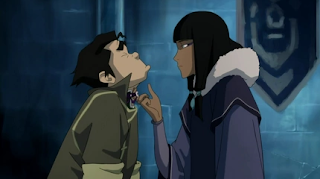 Pictured below is my favorite mistress of ice, Eska, putting a ring, well rather, a choker on the hapless Bolin. It's such a peculiar phenomenon that dorks are drawn to our dark charms. And so, for this month of bloody hearts, I compiled an album of more Goths paired with their fellow misfits, the Geeks. Click this LINK for the whole gallery. "You may express your joy through tears."